This time every year wrestling and entertainment fans all over the world come together to celebrate the Showcase of the Immortals, WrestleMania. This year, WrestleMania 28 was held in Miami, Florida. Here is how it went down. In a surprisingly short match, Sheamus defeated Daniel Bryan for the World Heavyweight Championship. In just 18 seconds, Sheamus claimed his crown as the king of SmackDown. In the second match, Kane beat Randy Orton in a good match. Many fans were pulling for Orton, but the Big Red Monster came out with the W.
Cody Rhodes dropped the Intercontinental Title to the Big Show, resulting in the first time Big Show has held the championship. Kelly Kelly and Maria Menounos beat Eve and Beth Phoenix is the divas tag match. In the End of an Era match, The Undertaker defeated Triple H is a classic Hell in a Cell match. With Shawn Michaels as the referee, the emotion in the match was high and the aftermath saw the three legends walk out together for likely the last time. In battle for being GM of both RAW and SmackDown, Team Johnny beat Team Teddy with The Miz scoring the winning pin making John Laurinaitis the GM of both shows. In another classic match, CM Punk defeated Chris Jericho to retain the WWE Championship. Punk forced Y2J to tap out to the Anaconda Vice submission hold. The main event saw The Rock go over John Cena. 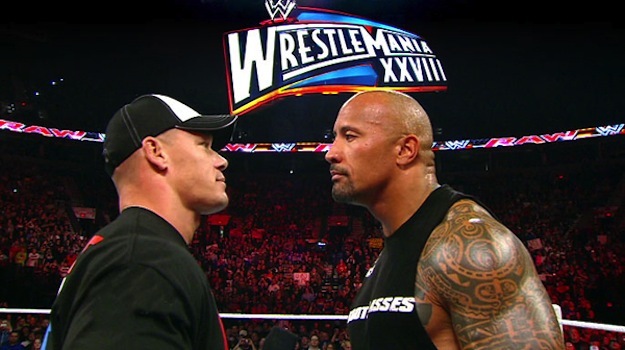 After over a year of build up, John Cena and Dwayne Johnson finally squared off. Surprisingly, it was decided that Dwayne would go over. This is likely leading to a best of 3 series.